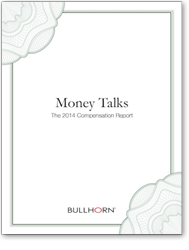 In the first-ever Bullhorn Compensation Report, “Money Talks,” we surveyed 1,337 anonymous staffing and recruiting agency professionals about compensation. Our respondents disclose how much money they actually made last year, segmented by primary recruitment type (perm, temp, contract, exec search), role (recruiter, salesperson, CEO, recruiting manager and more), agency size, and industry. Find out how you and your teammates stack up.